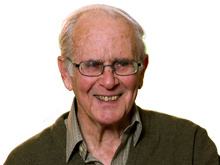 Gavin Souter AO is a journalist, historian, author and patron of the Mosman Historical Society. He wrote Mosman: a history for Mosman Council in 1994 and regards the suburb rich with historical material. He reveals some of this wealth when talking about the early defences at Middle Head and the Amphitheatre built at the northern end of Balmoral. I am a Sydney-based independent publisher trying to contact Gavin Souter. If you have his contact details, could you please pass on this note. I would like to get in touch with Gavin Souter with regard to some history and possibly a photo of St Hilda’s Anglican School for girls. He mentions it briefly in his book and I can’t find anything else other than newspaper clippings of exam results for the school. I’m sure there will be others interested too. My mother and her sister attended the school in the 1920’s. For interest sake I have a school school lapel badge that the historical society or library may be interested in. Any help would be appreciated. I am trying to get in touch with Gavin Souter – I am a freelance radio maker at ABC Radio National and am looking into a poet he has written about. My wife and I moved to Mosman in 1965 and we lived in Mandolong Road down near Balmoral, No 28 It used to be quite a long while ago, Cannon’s dance hall. There was no trace of it left in our back garden, but we knew it had been there and it sort of interested my wife Ngaire in Mosman’s early history. She lived in Mosman since the age of three and she soon after we arrived in Mandolong Road, started doing articles for the Mosman Daily about the streets of Mosman, and that ran in 1966/67. There were a lot of them and that was quite a good introduction for me as well too – the history of Mosman. But I didn’t really get involved in doing Mosman’s history for quite a few years after that. I regard Mosman as really the richest of Sydney suburbs with historical material. It’s quite amazing the things that have happened in this place starting with Governor Philip being there three days before the first fleet arrived at Sydney Cove, which was a pretty early start for us. But of course the Borogegal people had been living in Mosman for at least 6000 years, and so that’s when I guess Mosman’s history started after Philip – The Sirius, when it came back from – the flagship of the first fleet, it went to Cape Town in 1789 to bring back food because the colony was starving in Sydney Cove and it had a very rough voyage back and was damaged on the rocks of Van Diemen’s Land and needed repairing and re-fitting, and to do that it went over to Mosman Bay and the crew of The Sirius were living there for the best part of six months, so they were the first European settlers, or residents of Mosman. I tend to think of Mosman as a Peninsula. At first glance it looks like a pretty big Peninsula but if you regard it as spreading east from Cremorne, fairly widely to start with and then tapering off to get to Middle Head. It’s very symmetrical and you’ve got something on the north side and something on the south side all the way along. Quaker’s Hat Bay on the north side, Mosman Bay on the south side, the Spit on the north side, Bradley’s Head on the south side and Balmoral on the north side and Chowder Bay on the south side, and Cobbler’s Beach on the north side as you get almost to Middle Head, and Obelisk Beach on the south side. It makes me think about a Peninsula as a place where a lot of things have happened. For some reason tended to associate it with the Peninsula War, which was going on in Mosman’s early period and it’s odd that this Peninsula should have such a military association also. It became Middle Head very early – became Sydney Cove’s first out of defense with the battery on Middle Head for an enemy that never arrived – that was expected to arrive any tick of the clock. George’s Heights had a battery later and more batteries were put in on Middle Head after the first one in 1801. This military association of Mosman’s, finds the expression in Military Road of course, which was put in to bring artillery to those sites on defense in Middle Head and Bradley’s Head and George’s Heights, and a lot of the streets are named after the battle in the Crimean War. So that’s one of the things that give the texture that I mentioned, to Mosman. Well, that’s right, the Peninsula was of course all trees to start with but because of the military connection and the reservations for military purpose, that were there originally but no longer are. That military presence really preserved the bush in a much larger area than would otherwise have happened, so today you’ve got the marvelous combination of almost virgin bush all around the foreshores, and of course the foreshores being almost all around the Peninsula starting at Mosman Bay and it’s all going anti-clockwise. It’s all rocks, cliffs or beach and then behind that, trees. Until you get around Middle Head past Balmoral, past Chinaman’s Beach, or past the Spit, almost all the way to Quaker’s Hat Bay and then there’s just a straight line across to Mosman Bay, which is now McPherson Street and Spofforth Street. That’s another episode in Mosman’s history. Another point in Mosman’s history is the Theosophy Society, which in the 1920s became very interested in building an amphitheatre at the northern end of Balmoral. The purpose of it was to be a site from which the – it’s difficult to explain actually. The Theosophists who had a strong presence in Sydney by that time, the movement had been founded by a Russian woman called Madam Blavatsky and the local authority was a Bishop Leadbeater and this movement believed that one of the masters of the universe called Lord Mitrea who periodically manifested himself in such vehicles as Pythagoras, Confucius, Jesus Christ, Sophocles – was about to manifest himself again in a young Indian boy, by that time he was 17, called Krishnamurti who had been found by Bishop Leadbeater and brought to Sydney and was living in the Theosophist community at Clifton Gardens in a house called The Manor that used to belong to the Bakewell family – was built by the Bakewell’s and he was to be in the amphitheatre, which cost £19,000 to build. It was a white painted concrete series of tiers rising in semi-circular tiers with the proscenium and pillars in front and it could seat 2000 people with standing room for 1000 more, and they were all to be there for the – whatever was going to happen and the way they saw it. Krishnamurti was smart enough to – by the due date he’d decided he wasn’t going to be it and he resigned from the movement and the movement later collapsed in Sydney, and the amphitheatre was sold to the Catholic Church and eventually demolished and there’s now a red brick series of home units on the site, which is just past – going north-east from Wyargine Point. It’s a pity in a way the amphitheatre isn’t still there as a ruin, it would really be something to add to Balmoral more perhaps than the home units are.